Special rates for Saturday to Saturday this summer. 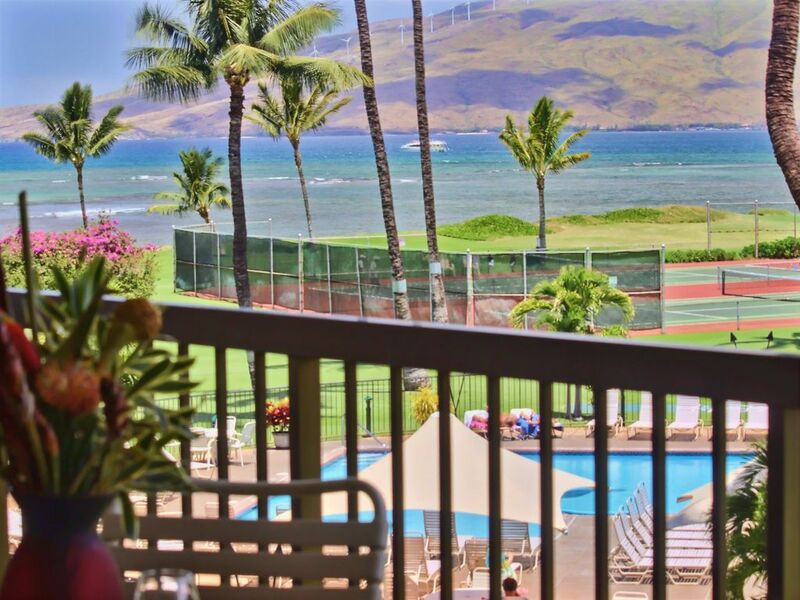 A spectacular view of West Maui Mountains, Malaeaa Bay, the ocean and the beautifully landscaped grounds await you in our two bedroom, two bath at Maui Sunset in Kihei. Open living/dining area has great view of ocean, pool and garden area. View Haleakala, a dormant volcano mountain, from front door. Convenient parking. Unit is 30'from the elevator. Very quiet unit away from highway. In the morning, watch the locals pick "ogo", (a delicate, delicious and edible seaweed which is great in a salad), as you walk along the beach. In the evening, watch the famous Maui sunset over the ocean. Postcard quality photos almost every evening. Walking distance close to all kinds of shopping, supermarkets, restaurants. Short drive to a variety of beaches for swimming, snorkeling, or windsurfing. One bedroom has a queen bed, the other has twins. The queen size sofa has an innerspring mattress. In consideration of other guests, smoking is prohibited inside the unit. A large pool and spa, shuffleboard, tennis court, croquet, exercise room, and sauna await those who just want to "hang out" in the complex. An activities director is available to assist those who want to explore other recreational activities on the island. Ask them about special discounts for local restuarants and attractions. The swimming pool is the largest in the Kihei area and has a large size shallow end for the kiddies. A large jacuzzi is next to the pool where you can relax at the end of the day and share your day's experiences with other guests from all over the world. Maui Sunset is a peaceful and quiet complex where you can really relax or use as a base for all-day or night activities. We have many guests who come back year after year.